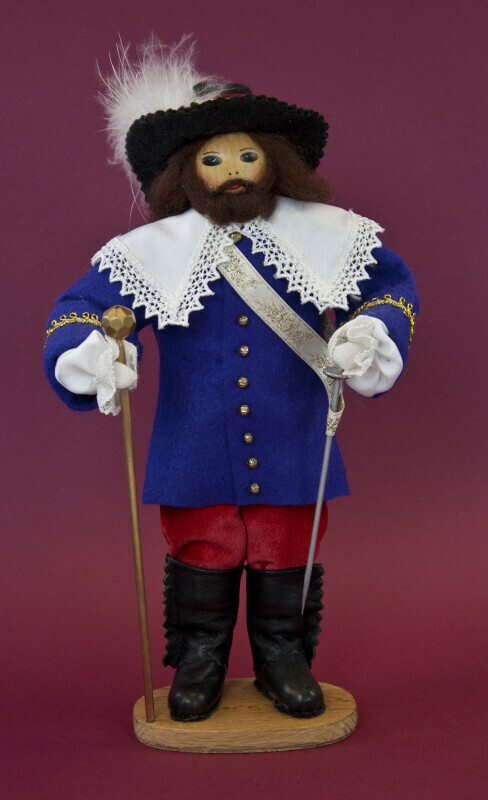 Canadian male doll depicting a governor in Canada in the late 1600s. He is made from wood and has a stuffed cloth torso. His head is a wood ball, with stenciled facial features. He has a large black hat made from felt. It has a gold headband and a large white feather. His hair and beard are synthetic material. The man is wearing a blue coat with a large white lace collar. His coat has gold beads for buttons and gold trim on his sleeves. His pants are made from red velvet, and he is wearing black leather boots. He is holding a sword in one hand and a scepter in the other. Tag: "Hand made in Canada by Jeannette Katz." "The Governor, Circa 1670." The figure stands 10 inches (25 cm) tall.